After years of focusing on the economic crisis, the European Union should become aware again that it also has other responsibilities, says former EU foreign policy chief Javier Solana in an interview with EURACTIV Germany. 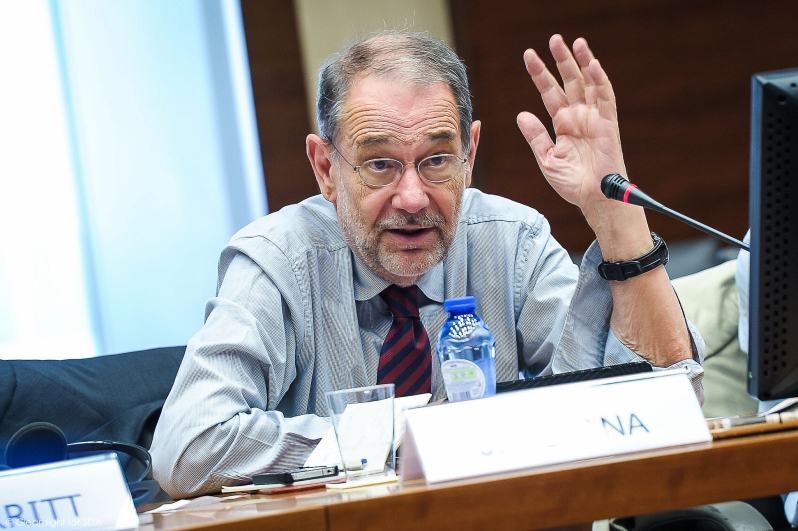 Javier Solana is former EU High Representative for the Common Foreign & Security Policy (CFSP), Secretary General of NATO and Foreign Minister of Spain. He was in Berlin on June 18 at the Friedrich Ebert Foundation to present the CEP-FES Task Force Report ‘More Union in European Defence’ , which aims to provide member states and the EU institutions with the narrative to strengthen defence cooperation in the EU, in the face of numerous emergencies in the EU’s strategic neighbourhood and ever-present security threats. Solana spoke with euractiv.de’s Editor-in-Chief, Daniel Tost. The Task Force on Security and Defence, which you chaired, issued a report suggesting policy actions to strengthen the EU’s strategic and institutional capabilities, as well as cooperation over resources in the field of defence. How do you assess the current willingness among the EU leaders to implement these? From a security perspective the defence situation is much more complicated today than say compared to 2007 before the economic crisis. We didn’t expect this level of complexity. Most of the energy of Europan Union has been focussed on the economic crisis. Now we are beginning to see the light at the end of the tunnel of the crisis. We should be aware again that we also have other responsibilities that are not only economic. We have political responsibilities in the rest of the world and in our neighbourhood. We are trying to give a wake-up call to reorganize our capabilities in crisis management, bring them up to date and possibly even go beyond. We are now talking about a European Union of defence. How to integrate the capabilities of the different countries to make them more efficient and to make it all cheaper. If you add up the budgets of all the countries on defence and security: it’s a lot. The productivity of these expenditures over time has been small. We need much more integration of those capabilities. It’s not only about saving money, but about making them more effective and productive in the world of today. Jean-Claude Juncker has said the EU needs its own military in order to deal with the Russian threat, as well as to restore the bloc’s standing around the world, but we are far from a consensus among the member states on this topic. President Juncker said something that was interpreted by some as that having an army means having a flag behind which this army appears. This is not going to happen. This is not the idea and not compatible with the treaty that we have. We have to put together the integrated capabilities of different countries but not create an army in the sense of a national army. Countries have to be responsible for their decisions to go abroad – be it military or civilian. We are talking about a union, which is like the monetary union, the energy union or the digital union. Something that is putting in common what we have, integrated much more and acts in a much more coordinated fashion. This is what we have in mind. It will be a very important step in the construction of the European Union. But the motivation for a monetary, energy or digital union is primarily of economic nature. I think defence and security have much more of a political component, though there are also economic or monetary issues. Think about the problem of the people that are dying in the Mediterranean. We should and could have been there to help them. We are doing this on the coast of Somalia with some success. So sometimes we don’t do things which are very well understood by the people. If you ask an ordinary citizen of the European Union if he would like the EU to do more in this domain, the answer has consistently been that over 70 percent have said yes. Then why do member states’ political leaders not do more? Well, the leaders are now concentrated on the economic part. We are trying to give a wake up call: other things are possible and necessary. And for this we need more integrations in this domain. Currently you are promoting this message on a ‘road show’ across Europe. How is it being received? I have been in several European capitals as well as in the United States. Everywhere I have found a very positive attitude. I think the European Union is needed. We have been absent from some of the issues that have been important. This is sensed by others who see a moral obligation to return to these issues. When the citizens see images of people suffering, they would like to see the European Union have a more humane attitude towards these people. This requires the deployment of people and maybe even military. Think about the Ebola outbreak. It required much more ready and able military capabilities. Your report concludes by recommending the European Council define a roadmap and EU leaders appoint a committee. How are such long-term procedures going to address the current threats and issues posed to the EU’s security and defence? This is a process. The sooner we start, the sooner it can be completed. If we don’t start, we will never finish. Keep this in mind. Now, for the first time the European Council has devoted meetings to this question. There is already movement. High Representative Mogherini is trying to write a new security strategy for the European Union taking into consideration the world of today. The strategy we had in 2003 and 2005, which I was responsible for, was for a different world. The world of today is much more multipolar. Multilateralism is what we want. The crises in our own neighbourhood should be enough for our wake up call to be heard. Five years ago, you warned that migration is a major challenge that Europe must face, which will only become a bigger problem over time. What do you say today? Today we do not only have economic migration. Now we have the responsibility for refugees, which is totally different. Since 1945, the world hasn’t had so many refugees or displaced people. I don’t think we are reacting to this with the generosity that used to be very well accepted by the Europeans. When you look to a country like Jordan, the number of refugees is huge. This should make you think. When you talk to the UNHCR, you will hear that the situation is dramatic. And here we are fighting for a quota on the distribution of refugees, which is not very high. It’s a little bit demoralizing. Just a few days ago, EU interior ministers rejected a plan by the Commission to distribute 40,000 immigrants from Italy and Greece to the other member countries. Are EU leaders failing their legal and moral responsibility to help the refugees? Those are very strong words. I think sometimes you get the impression that the attitude of solidarity is not there. Shortly on the topic of Russia: NATO Secretary General Jens Stoltenberg responded to Vladimir Putin’s remarks about adding new nuclear missiles to the Russian arsenal, calling it “saber rattling” and “destabilizing and dangerous”. What is your perception? Firstly, this is situation in which we have to prevent escalation in every direction. Escalation means to make an inappropriate statement. Escalation is also to respond to this with a statement which is stronger. This leads nowhere. We have to deescalate. This means opening channels of communication. Yesterday we were in Vienna and met with the OSCE where this was the sentiment. The Minsk agreement is there and has to be implemented. Remember that if it is not implemented by the end of the year, the border of Ukraine with Russia will still be in the hands of the rebels. Channels of communication need to stay open. Who do you see on the forefront? The foreign ministers of the Normandy Group. They don’t do it on the highest levels today but they maintain open channels. But then we have to open other channels, something we call ‘B-channels’. I talked to Russian intellectuals and politicians in Vienna to maintain an open conversation. Because otherwise the process of escalation may also continue verbally or then politically. This analysis is spot on. What is the use of France arming itself to prevent an attack from Germany? Of Belgium preparing to deter the Dutch? Of the English running nuclear subs in the case of a new Spanish armada? Who exactly is the Trident deterance meant for? It’s a long way for the Russian fleet to go there. It’s money wasted on symbolic statements. Much of Europe’s military structures are rooted in a past that no longer exists. It’s the EU that counts, and the EU we should support. The trident submarines by their very nature are mobile, they could be parked up beside any threat anywhere in the world they never need to submerge they are restricted only by their food stores which means they can hide away anywhere on the globe for a year or more, Russia, China, Argentina none of them know where they are so they will never threaten this country directly without the fear of mutual destruction. It is a Nuclear deterrent that keeps Russia at bay, do you think they would be engaged in Crimea & Ukraine if Ukraine hadn’t handed over its Nuclear weapons when it signed its mutual defense pact? The EU is no source of defense as it is populated by too many lefty tree hugging loonies that think they are safe at night when they leave their front door open. There is a word for parking weapons of mass destruction where ever you please for political gain, it’s called terrorist threat. The nuclear deterrent is a policy based on criminal insanity that the world has long recognized must be abandoned because all it can ever do is wreak massive destruction and untold suffering. You don’t nee to be a lefty to see this form of mental illness for what it is. The hibernation is over ! The E.U. needs and must have a united defence strategie !! Then Acta non Verba without loosing anymore time ! We will work with the EU on defense matters when our interests converge but never for the EU & never under the command of EU officials. Doesn’t stop you joining a EU led defense force though. Bearing in mind the French will never cede sovereignty of their forces to the EU who do you think will lead this visionary EU defense force? Hello everyone,My name ares Joyce Levinius a citizen of USA,I want to testify of the good Loan Lender who showed light to me after been scammed by 2 different Internet international lenders, they all promised to give me a loan after making me pay a lot of fees which yield nothing and amounted to no positive result. i lost my hard earn money and it was a total sum of 3,000usd. One day as i was browsing through the internet looking frustrated when i came across a testimony of a man who was also scammed and eventually got linked to a legit loan company called Aliko Dangote Loan Company,where he finally got his loan,So i decided to contact the same loan company and then i told them my story on how i have been scammed by 2 different lenders who did nothing but to course me more pain.I explained to the company by mail and all they told me was to cry no more because am in the right company i will get my loan in their company and also i have made the right choice of contacting them. i filled the loan application form that was given to me by this great company and proceeded with all that was requested of me and I was given a loan amount of $100,000.Dollars by this great Company (Aliko Dangote Loan Company} managed by Mr Aliko Dangote and here i am today happy because Aliko Dangote Loan Company has given me a loan so i made a vow to myself that i will keep testifying on the internet on how i got my loan.If you are out there,My dear beloved brothers/sisters looking for real loan company,I will advice you to kindly and quickly contact Aliko Dangote Loan Company now for your loan via email:alikodangoteloancompany@gmail.com,and he is a God fearing loan lender,And i know that they will never let you down….